Experience shows that the Paralympic Games ultimately do improve the situation for disabled people in the host country. Russia is hosting the Paralympic Winter Games for the first time, an event that gathers 1,350 athletes and team members from 47 countries. Over the past decade, Russia has made incredible progress, gaining top positions in the team events since 2006. 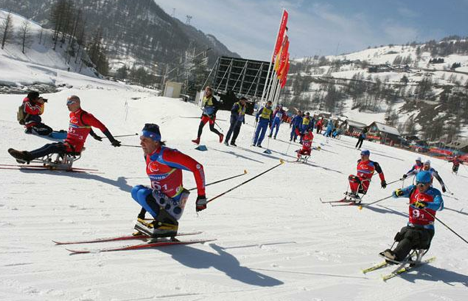 What has caused this success and what kind of results can the Russians expect to achieve in Sochi at the 2014 Paralympics, held on March 7-16? The Paralympic movement started to develop in Russia only 17 years ago with the creation of the Russian Paralympic Committee. In most Western European countries and the US, involving disabled people in sport dates back to the Fifties. Paralympic sport in Russia was in its infancy in the Nineties and lacked infrastructure and financial support. Programmes had to be set up swiftly to prepare coaching staff and experts in adaptive physical culture; training bases for disciplines needed to be established; equipment and logistics issues resolved. The efforts helped Russia to make a monumental breakthrough in Paralympic sport and become a centre of the international movement. In a short time, the rest of the world began to talk about the “phenomenon” of the successful Russian Paralympic team. Russian athletes first took part in the Paralympics in 1988 on the wave of perestroika (“restructuring”) in the Soviet Union. Back then, only visually impaired athletes competed. They won gold medals solely in track and field and the team finished 12th overall. produced its best ever performance in summer sports, both in terms of the number of medals won and its table position. The team gained 102 medals (36 gold, 38 silver, 28 bronze) in individual and team disciplines overall. Forty-two athletes won gold, and 14 world records were set in swimming and athletics. The number of Russian athletes taking part has also risen sharply. The summer team in London had 182 members, compared with the 60 who represented Russia in Atlanta in 1996. As for winter sports, only 26 Russian athletes competed in the Paralympics in Salt Lake City in 2002, while the country’s sporting delegation in Sochi will be 162-strong, including 64 sportsmen and women. For the first time, Russia will participate in all events. These impressive results and the active development of parasports in Russia have come about first because of the athletes’ motivation. For people with disabilities, a sporting career and taking part in the Paralympics are great opportunities to prove to themselves that they can strive for excellence. For Russian athletes, participation and victory in the Paralympics are seen as a springboard to a fuller life and recognition in wider society. Paralympic sport in Russia. It also involves organising assistance for disabled children, promoting the ideas of the international Paralympic movement, training sports professionals to work with the disabled and creating jobs. summer sports, is financed from the public purse, while their US counterparts, for example, are funded by the private sector. recognition and respect in society at large. The Parasport foundation, together with the Paralympic Committee, holds the Return to Life annual national awards ceremony to celebrate the contributions of athletes, coaches and doctors to the development of Paralympic sport. enormous efforts to integrate people with disabilities into the community. of the 2014 Paralympic Winter Games will help change stereotypical attitudes to disability in society. Official statistics from the Ministry of Labour and Social Protection show there are 13 million people in the country with disabilities, equivalent to 9 per cent of the population. The US is home to 56.7 million disabled people (19 per cent) and England has eight million disabled people (18 per cent). China’s official data suggest it has 83 million disabled people, or 6.3 per cent of the population. able-bodied. And in most cases, the barrier is erected on both sides. Many parents of dis-abled children hesitate to send them to educational institutions with an inclusive approach, where “normal” children study side by side with their disabled contemporaries. In Russia, the integration of children with disabilities into mainstream education only began in the 2000s, and presently just 2 per cent of Russian schools practise this inclusive approach. Paralympics are not a panacea, but should be seen as a real opportunity to change attitudes to people with disabilities, and to draw public attention to the problems of their social integration and rehabilitation. It is hoped that the 2014 Paralympic Winter Games in Sochi will nudge Russia further towards improvements for people with disabilities. Oleg Boyko is the president and shareholder of the Finstar Financial Group investment holding. In1996, he suffered a serious spinal injury. Today, he heads the Commission for Development of the Paralympic Movement in Russia under the Russian Paralympic Committee. The article was first published in a special issue of Russia Direct Quarterly report "Sochi: Going for the Olympic Gold." To get free access to the report, subscribe here.